One of our favourite things about London is the opportunity to do so many things for free, so whether you like being frugal, or you’re feeling the pay day pinch, this city of ours has a lot on offer. Even better when said freebies, Sculpture in the City in this case, returns every year with a new version. 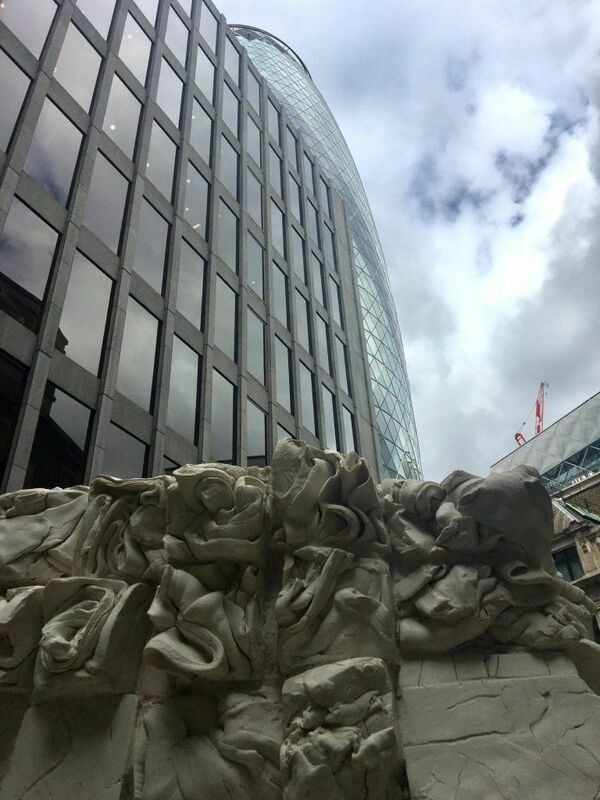 This weekend we had a trot around the City of London, eerily quiet because it was the weekend, but the perfect time to seek out some free art. 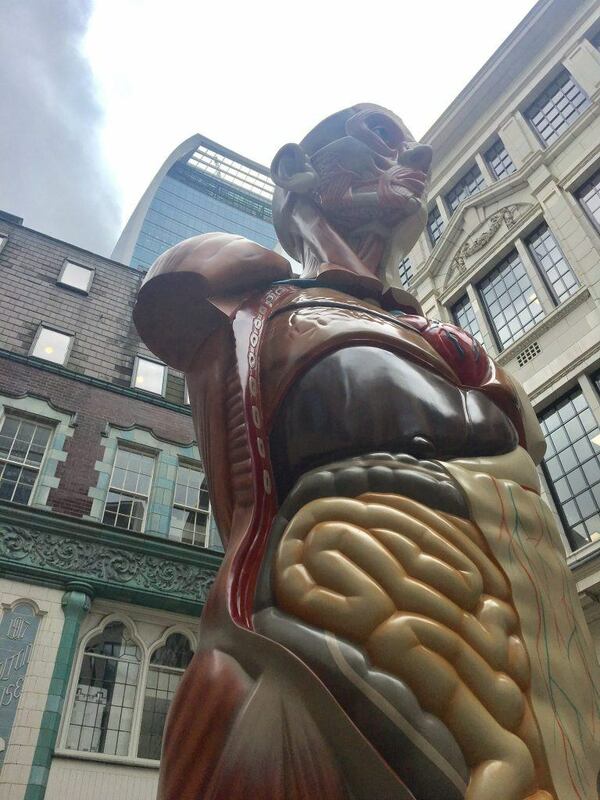 Damien Hirst’s Temple, is a larger-than-life (21 foot to be precise) bronze anatomical model of a human torso. It reminded us of those biology models in school, but what we really liked was the imposing size and how experimenting with form and structure can create a fantasy world. Whether it’s huge chairs to clamber upon or tiny doors to fit through, playing with dimensions is an excellent way to create a quirky and mystical-themed event. At first glance 4 Colours at 3 Metres High was a little underwhelming, but then the sun poked its head out of the clouds it all started to make sense. 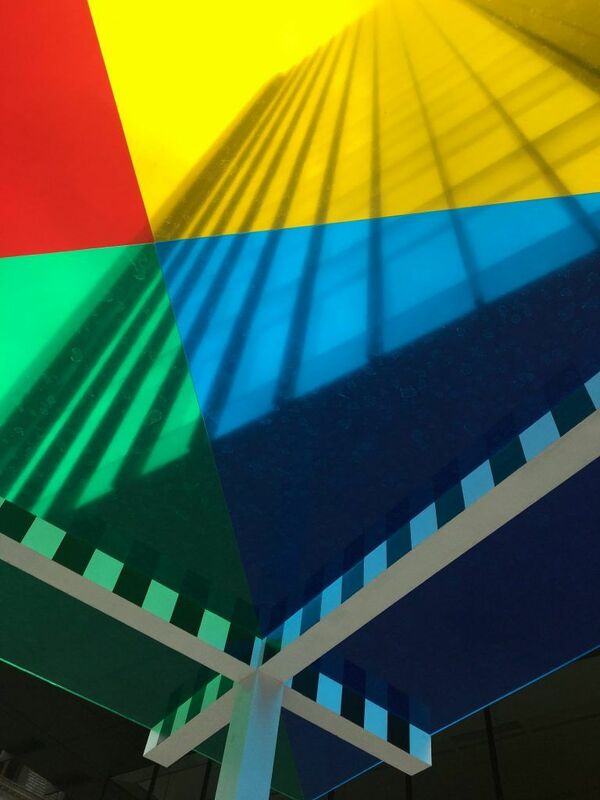 The simple pergola has a brightly coloured roof, which not only gives your surroundings a pop arty feel, but also casts coloured shadows on your feet. The use of natural (and therefore unreliable) light to create an ever changing environment is a great way to keep guests engaged at events. Reminiscence by Fernando Casasempere was full of texture. The ceramic bricks were a mixture of smooth finished blocks, as well as twisted and weathered pieces. The contrast between the two surfaces evoked an unfinished feeling, as if there was still more to come and this wall could grow – much like the City of London. This tactile sculpture reminded us of eclectic props that can become focal points and areas of interest for your guests. Contrasting materials can make wonderful set pieces for a reception space or table centres – have a play! Black Shed Expanded was another one of our favourites, with an impressive backdrop against the Gherkin. The simplistic use of the humble garden shed and the brightly lit interior was a great contrast and reminded us of the important of bold, impressive lighting at events. Not all lighting has to be functional, and often the best can add a powerful statement (neon tube lighting) or create an atmosphere (candles or lanterns). 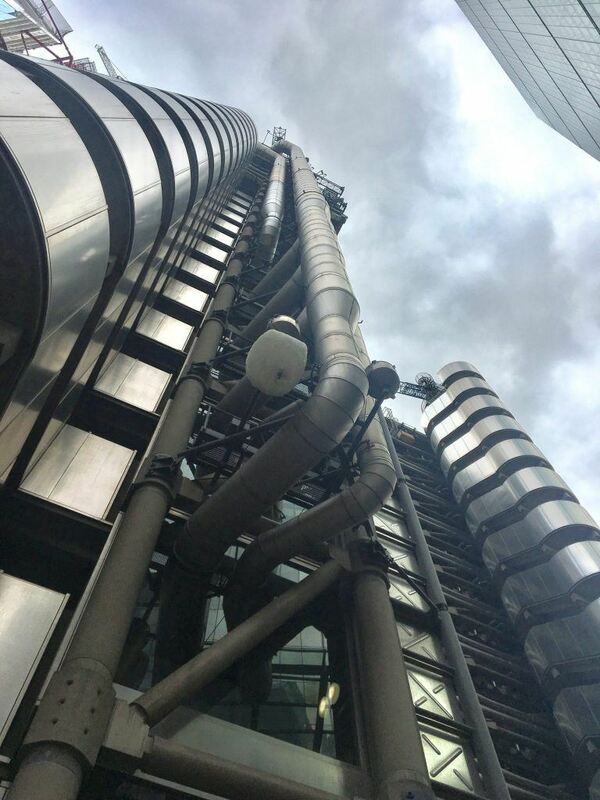 There were three parts to Support for a Cloud and they were a bit of a challenge to find, being attached to the vast Lloyds of London building didn’t help the hunt. It was the detail we enjoyed here and the challenge for seeking something out. We love this part of an event – injecting a little bit of fun and mystery to your event keeps guests guessing. You could look at it as a mini treasure hunt (an excellent team building exercise). The best thing about Sculpture in the City is you’ll probably stumble across most of these by accident over the next couple of weeks. We love a bit of culture to inspire us and remind us to keep on exploring. 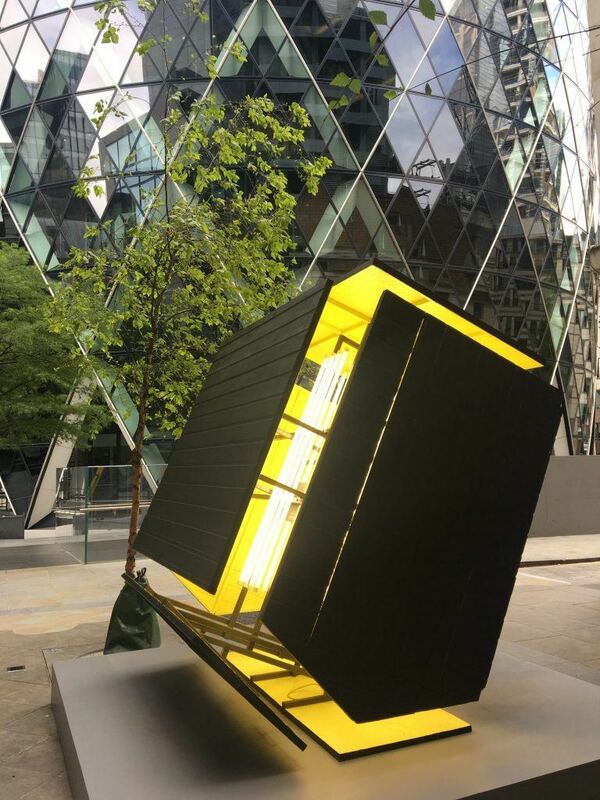 What did you think of Sculpture in the City? Let us know on Twitter. If you liked this blog, you’ll love our newsletter! Sign up here.